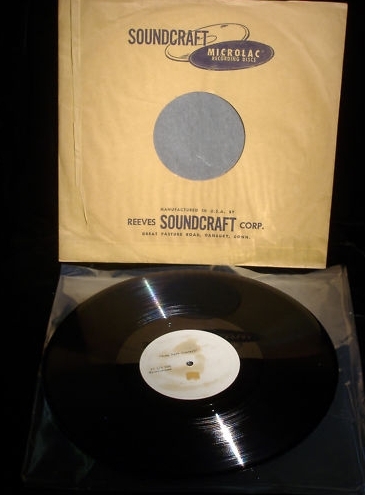 This 12" 33rpm acetate turned up on eBay in the early summer and sold for $2,750.00 on June 2nd 2011. The recording comes from Forest Hills 17th August 1963. 'Only A Pawn In Their Game' and 'A Hard Rain's A Gonna Fall' are not in circulation. As of the time of writing, the recordings from this acetate are not available to listen to, unfortunately. (a) Bob Dylan (vocal & guitar) and Joan Baez (vocal & guitar). 4, 5 Incomplete stereo PA recording, 7 minutes. 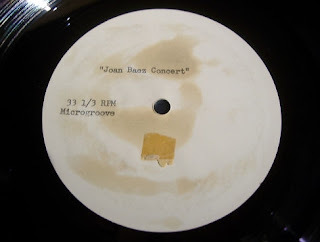 SIDE 2 IS JOAN BEING INTERVIEWED AND SOME MORE LIVE STUFF.THIS WAS FOUND IN A RECORDING ENGINEERS COLECTION WHO WORKED FOR RIVERSIDE RECORDS.IN THE FIFTIES AND SIXTIES.THIS WILL HAVE TO BE SENT W/INSURANCE AND REGISTRATION. RECORD:EX LITE PLAY SOME STORAGE AND PRESS MARKS BUT SOUNDS FINE ONE POP ON VERY START OF LP. I was there and the set list is exactly like I remember. I was there too and have to admit that when Dylan started to sing (he had not been advertised) many people left. The Baez concert did circulate as 14 tracks plus duet "Troubled.." and "Blown..." which cuts out half way. Then the following extra tracks have since emerged via this acetate -Baez doing "Don’t Think Twice” then introducing Bob…who does “Pawn In Their Game” then “Hard Rain” . But all sources list “Farewell” as indicated here but as it has not emerged is it actually on the acetate ?